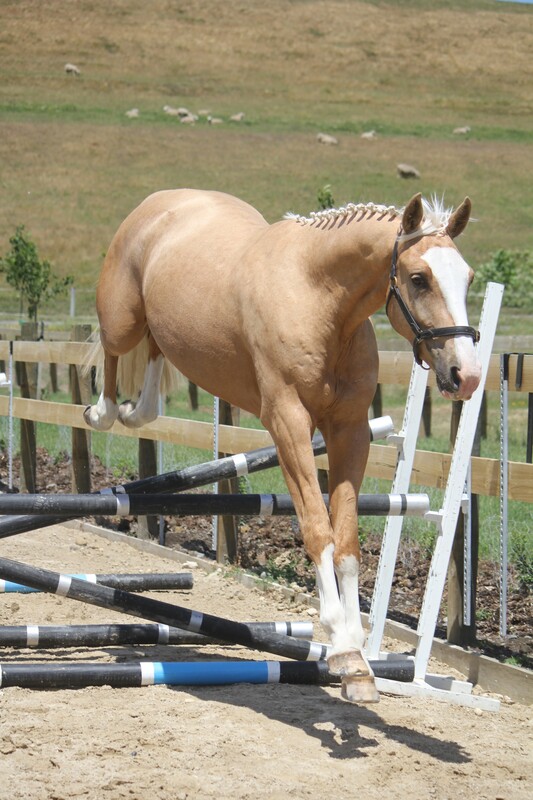 Stamp VWNZ (Stamp) is an exceptionally beautiful Palomino gelding, who will mature at about 16.2hh. He has great bloodlines with horses such as Ikarus GF and Centavos. Stamp is a well matured young horse who is a delight to have around the stables. He is full of happy personality, and an easy going nature and confident air about him. Stamp has been quietly produced and allowed to mature with fantastic nutrition. He is quietly backed and happy hacking around the farm, moving sheep and cattle. Stamp is working kindly on the contact, confident with obstacles and riding down to the river. He is good to handle, truck/float, stable, shoe and lunge. Stamp would suit someone wanting a beautiful young gentleman to produce. He will excel as the ultimate allrounder. Stamp is well balanced, has big beautiful movement and a scopey relaxed jump.